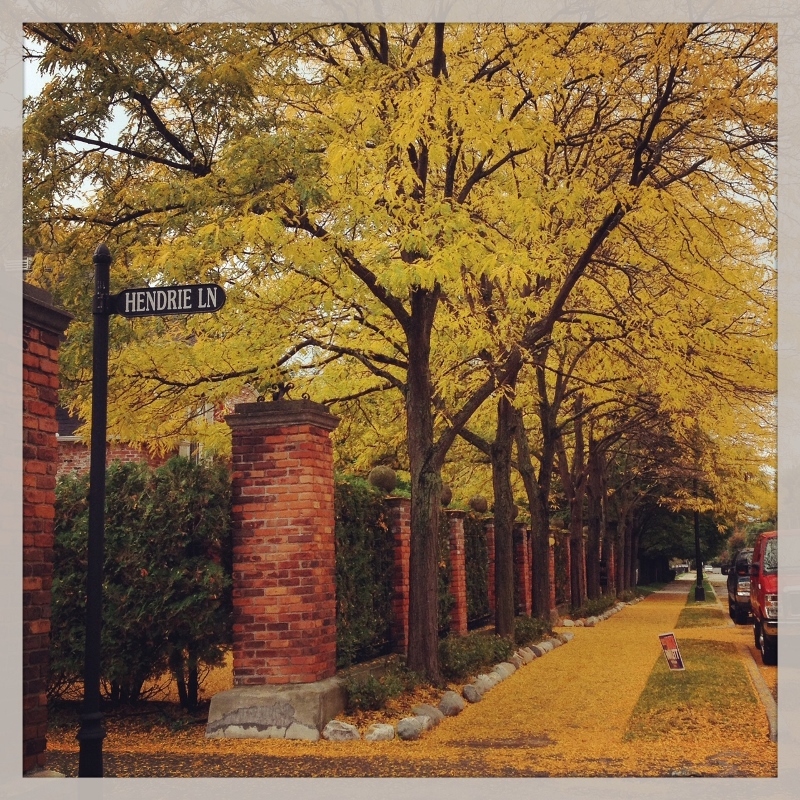 1) I’d forgotten how magical Fall is. I haven’t experienced a true Fall since I lived in Reno and that was almost 20 years ago (!). I can’t stop ooh-ing and aah-ing and taking photos (and I’ll have a bunch more to share soon). 2) Bug of the month: the cicada. A large, invisible (I’ve never seen one, have you?) insect that makes a loud buzzing noise. All day long. Wikipedia says, “Many people around the world regularly eat cicadas.” I can see that. 3) The worst peril of potty training is not your kid rolling around on the floor screaming “I want a diaper!” for 20 minutes. It’s when they finally poop in the potty and you go to empty it and your face gets splashed with toilet water. 4) I didn’t cry on the first day of school as expected. What I did do was giggle as I ate my lunch on the couch and watched Season 2 of Mr. Selfridge. 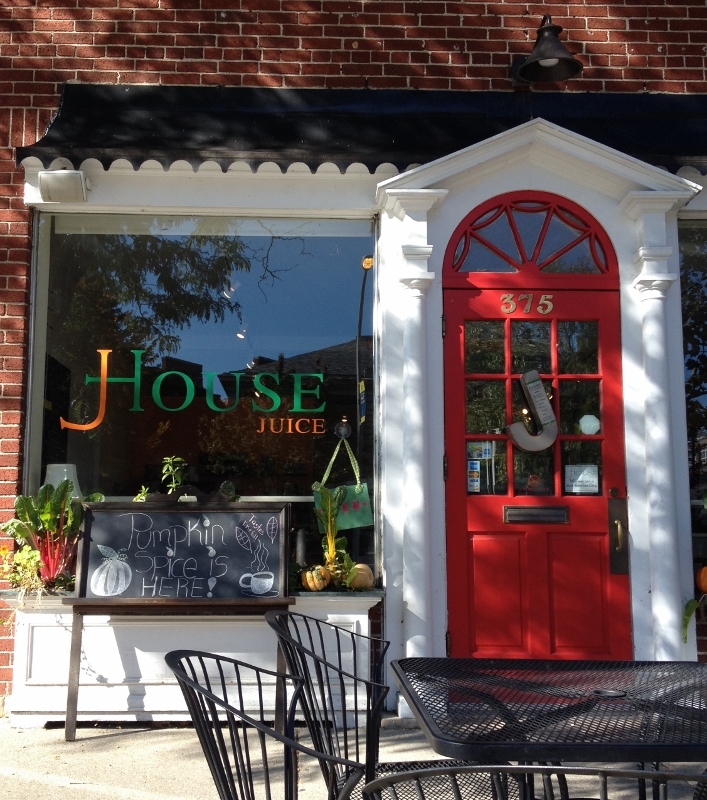 5) I’ve been wanting to check out J House Juice on Fisher and finally went in. In addition to a full Starbucks menu, they offer smoothies, fresh juices (Lucy and I shared a pineapple, grapefruit and ginger blend) and delicious coconut desserts that are big enough to satisfy your treat craving, but no so big that you wish you hadn’t. 6) The city of Grosse Pointe Farms does not want your old recycle bins. We bought one of their larger bins, so I called to ask if we could give back our small bin (they are currently out of stock, I happen to know). Me: Wait, you don’t recycle recycle bins? That’s kind of ironic, don’t you think? Woman on Phone: Well, residents don’t want used bins, they want new bins. Woman on Phone: They just don’t want to have a used bin, do you know what I mean? Me: I would want a used bin, actually. Woman on Phone: You could label it “trash” and we’ll come pick it up (Ummm). Or you could use it for something else. Me: Uh, okay, we’ll use it, thank you. 7) And the best Asian restaurant in Grosse Pointe is…. (drum roll)…Trader Joe’s. Sad, but true. (And yes I’ve been to Bluefin Sushi). 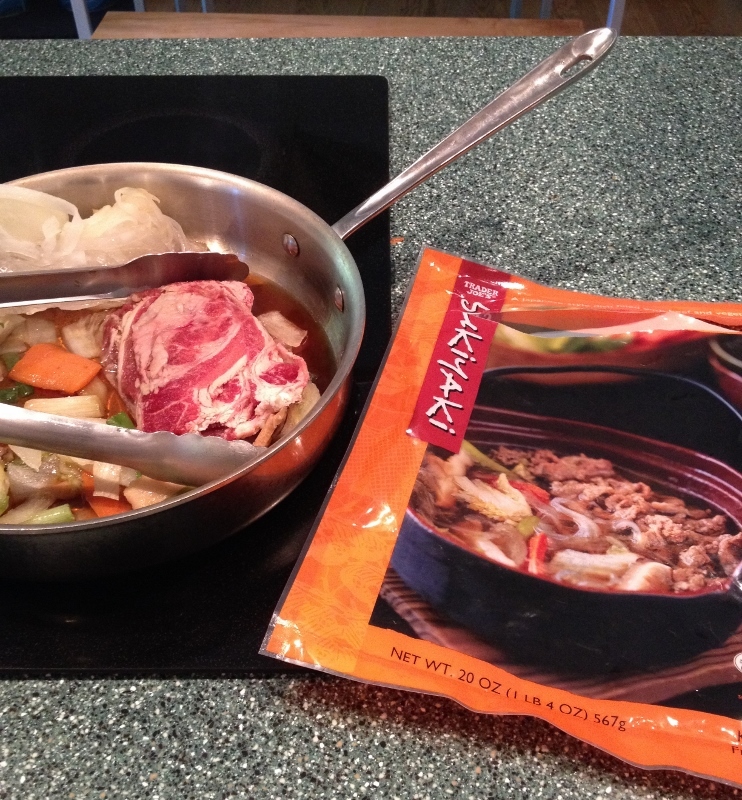 Maybe I’ve been deprived for too long, but the other day I whipped up their frozen sukiyaki, added some green onions and rice and I have to say, pretty darn good. Their orange chicken and pot stickers are also not half bad (do I need an intervention?). 8) A couple months ago, I requested a book from the library that was not in the Grosse Pointe library system or the State of Michigan library system. A couple weeks ago, I got an email saying the book was waiting for me at the front desk. Sure, Amazon is faster, but the library is free. Love. 9) We’ve painted the rest of the house, but now need to settle on a paint color that will tie our future kitchen to the family room. My husband has likened my paint selection process to that of a serial killer (really?). 10) I thought I would have all this free time when school started. I was going to be Martha Stewart on steroids. Baking, cleaning, taking lessons, general do-gooding. In reality, by the time I blink and have my second cup of coffee, it’s time to pick them up. Argh. 11) The day I do not have to make a school lunch, I will have all of you over for a champagne toast and a dip in the hot tub. 12) Reupholstering a couch is not $600 (which I budgeted for). Or even $800 (my budget cushion). Not even close. So until we can afford it, the bright yellow floral couch and zebra rug will have to find a way to get along (but does it look like they’re @^#%$* getting along!? The answer is no). This entry was posted in Fun, List and tagged 2014, Funny, Grosse Pointe, Humor, Musings, September, The List, What I've Learned. Bookmark the permalink. I absolutely love your commentary and dry, oh-so-you Lani, sense of humor. Your blog reads like a newspaper column. The term Blog just doesn’t do it justice. Miss you my dear friend! What a compliment – thank you! Miss you, too. x.o. 1) Jealous. So jealous. Please share pics. Miss seasons. 2) I might have seen one once. Cicadas are everywhere in Thailand. I hear them everyday. 6) Awesome. And by awesome, I mean, WHAT??? 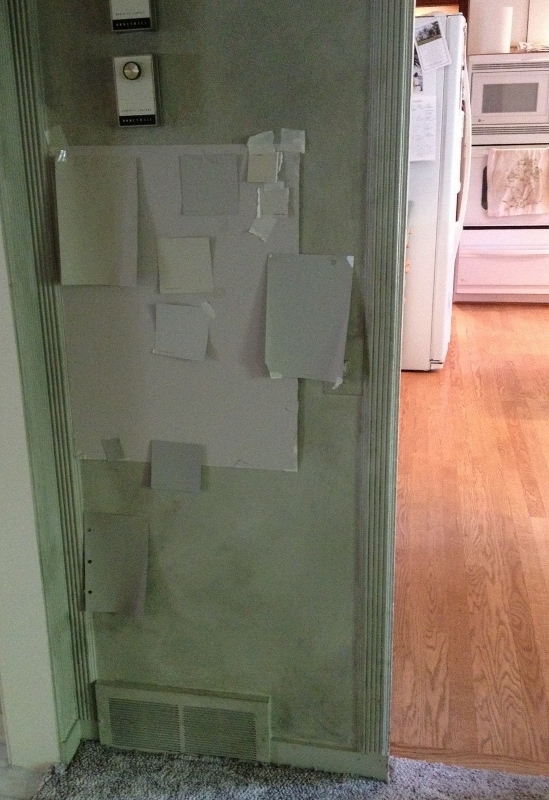 9) I like the paint swatches. So high art. See, I like the couch, too. 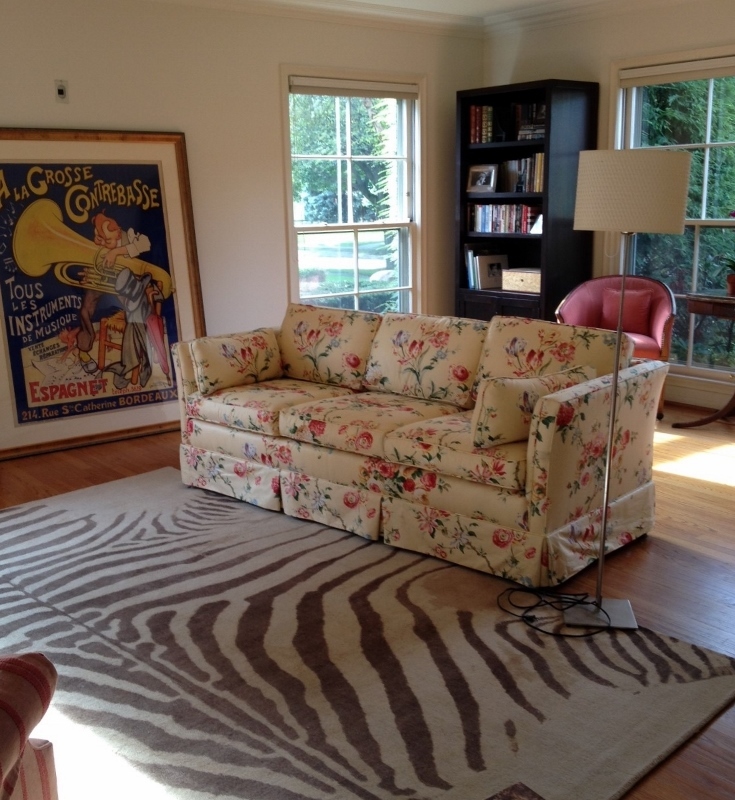 AND if it weren’t for the zebra rug, the couch would go perfectly with the painting and pink chairs. So…..new couch or new rug? The rug is new, but the youngest girl’s room needs a rug and she loves zebras. Making Mexican right now. Tacos. Wish I were as intuitive with Asian cooking, but for some reason, I can never seem to go, “oh, needs more fish sauce” or whatever. With Italian and Mexican, I can. You? Okay, youngest girl gets the zebra rug! A rug has got to be less expensive than a couch, right? I was thinking the same thing, the couch looked good in the room with the chair and painting. With Asian cooking I generally just wing it and it usually turns out pretty good. I’ve also followed recipes and that is even better because I have this really odd habit of not tasting my food while I’m cooking. Just get out a recipe for something you are craving and try it! Yes, I need to just do that (find a recipe, try it, tweak it). I do that too! I find that I’m at the very end of making a dish and realize I haven’t tasted it? So amateur! haha. Zebra rug aside though, are you loving all your new space? Your new home must be massive compared to San Fran! It’s so huge and now I am lamenting the cleaning factor. I’m actually on my way to get another toilet brush and cleaning supplies so I don’t have to keep lugging stuff upstairs (and back down). How am I going to keep this place clean!?!?! OCD. I understand. But after living in the bamboo woods with 2 cats in a rustic cabin, my OCD tendencies were let go – a bit, for sanity reasons. Plus, my b/f doesn’t clean. Ug. I know, right? Yes, cleaning supplies in every bathroom. One sock. Two socks. Three socks in bed. Dr. Seuss? Your reaction to not being able to recycle a recycle bin was perfect!